Canada wing Magali Harvey has been named the IRB Women’s Player of the Year 2014 following her side’s 21-9 defeat by England in the Women’s Rugby World Cup 2014 final at Stade Jean Bouin in Paris on Sunday. 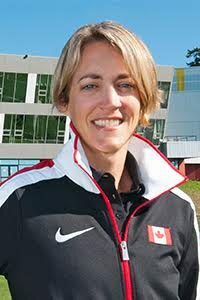 Harvey is the first Canadian to win the prestigious award and reflects the growth of women’s rugby in recent years, the wing having played a key role in Canada reaching their first WRWC final. The 24-year-old edged out her captain and Canada number 8 Kelly Russell, Ireland full back Niamh Briggs and France number 8 Safi N’Diaye following a comprehensive voting system. IRB Chairman Bernard Lapasset said: “I would like to congratulate Magali on winning this prestigious award. It is extremely well deserved. She has lit up Women’s Rugby World Cup 2014 with her combination of electrifying pace, elusive running, ferocious defence and accurate place-kicking. “Her try against France in the semi-final was perhaps the tournament highlight and certainly one of the tries of the year. I was privileged to have been sitting in the stand to watch it live. “It is also important to highlight the contribution of other players too. In particular, the other women who made the shortlist – Niamh Briggs of Ireland, Kelly Russell of Canada and France’s Safi N’Diaye. Those players – and many others who just missed out – have helped to make this tournament such a success. Harvey caught the eye with her performances throughout the tournament, scoring a hat-trick in a 26-point haul in Canada’s opening win over Spain and then going virtually the length of the field to score a try in the semi-final win over hosts France.